Last year I read two Science Fiction books by Toronto Writer Robert J Sawyer, Mindscan and Flashforward. 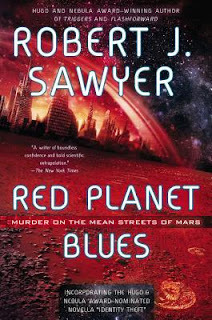 I enjoyed both so picked up his newest book Red Planet Blues. Alex Lomax is the one and only private eye working the mean streets of New Klondike, the Martian frontier town that sprang up forty years ago after Simon Weingarten and Denny O'Reilly discovered fossils on the Red Planet. Back on Earth, where anything can be synthesized, the remains of alien life are the most valuable of all collectibles, so shiploads of desperate treasure hunters stampeded to Mars in the Great Martian Fossil Rush. Although I really enjoy science fiction, I am not a fan of private detective novels, so going in, I did not know what to expect. The story is interesting enough and with a good ending. If I had any complaints, I found it just a touch long and a little confusing in places but for the most part was an easy enjoyable read. It is not a great book, but a good one. For a person who likes sci-fi and detective novels, this book would be a home run for sure!